As a Christian school, LCA sees no divide between the secular and the spiritual. All truth is God’s truth whether John 3:16 or chemistry. LCA is intentional, however, about providing opportunities for focus on the spiritual development of students. LCA encourages and supports the many self-organized accountability groups that exist amongst the students. These groups typically meet at local restaurants and coffee shops before school. Accountability groups have proven to be an effective way for students to study Scripture and support one another. Upper School students are excited to kick off each school year with Alpha Camp, an off-campus retreat led by the senior class. Held at Lake Burton, Alpha Camp is a chance to get away from the pressures of school and connect with other Upper School students in order to forge relationships that will last the year . . . and hopefully longer! Alpha is strategically positioned right at the launch of the school year so that ample time is given to ensuring that the year gets off to the right start. These days are filled with engaging worship, study of God’s Word, small group accountability, and prayer while also providing plenty of time for recreational fun, renewing old friendships, and welcoming new students. Alpha is always a highlight of every school year! 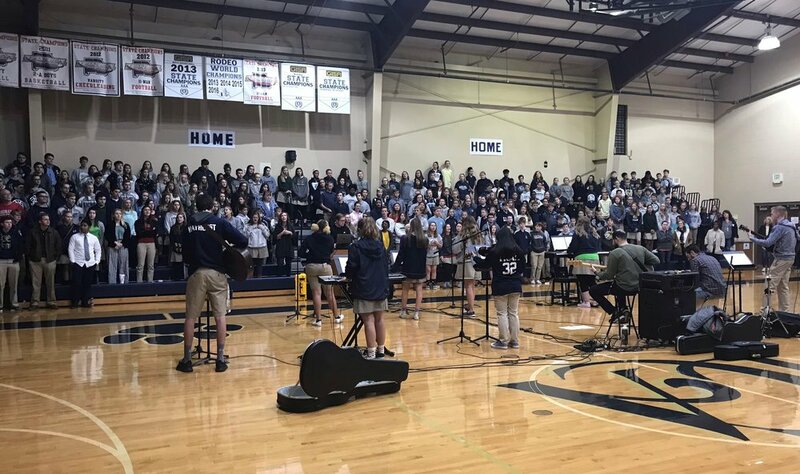 Chapel is a special time for the Upper School student community. The bimonthly program is designed to encourage students in their personal walk while driving their desire to love and influence the people in their lives. The worship music sets the tone for an attitude of worship followed by applicable teaching. Wednesday mornings as well as participates in community events.